The majestic moose is the second largest animal in B.C. and ranges through most of the province, with the exception of coastal areas and southern B.C.’s dry valleys. But it’s a regal beast you don’t want to get too close to. That’s why you’ll see moose warning signs posted by the Ministry of Transportation and Infrastructure along some stretches of highway. Weighing up to 600 kilograms and standing as tall as two metres high at the shoulder, moose are bigger than you think – and a collision with one can badly damage you and your vehicle. 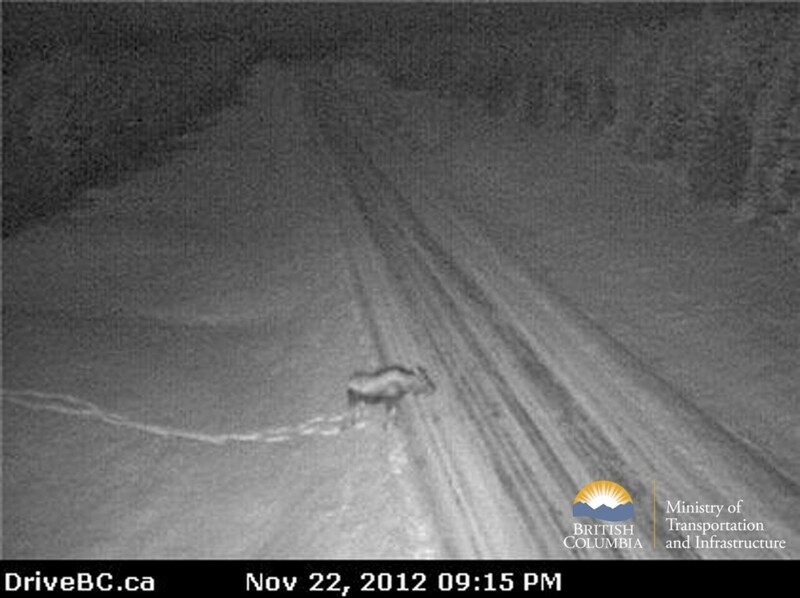 The tricky thing is that as humongous as moose are, spotting one in the dark can be difficult. At night everything becomes less visible to motorists, and moose with their dark coats, can blend into the surrounds until you’re up close. Like deer, they have reflective eyes, but the headlights of most passenger vehicles are beneath a moose’s lofty gaze. The low visibility of moose at night is wise to consider now, with daylight hours at their shortest. And if you live or travel in northern B.C., where about 70 per cent of B.C.’s approximately 210,000 moose dwell, you’ve got the longest hours of darkness in the province. While people are often out and about less in the coldest months, moose stay active. They (and elk), with their long legs, big hooves and powerful bodies, plow through snow more easily than deer. In winter, all three species of animal seek out valley bottoms to shelter from the wind, and of course those areas can be natural places for highways to travel. Hard to spot at night – this image is one of our most popular Facebook posts. 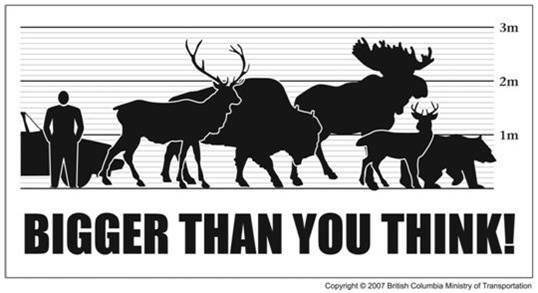 The ministry’s statistics show that vehicle collisions with moose reach their peak from November to February. While collisions with deer are much higher, the outcome is usually less drastic for motorists because of the deer’s smaller size. 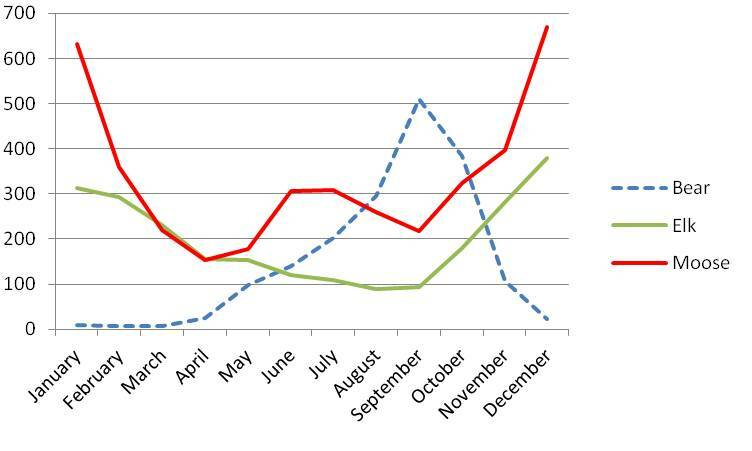 Moose collisions between 2002 and 2011; a total of 669 moose were killed in January (vs. 177 during the month of May). The key to keeping a safe distance from moose (or any wildlife) is to drive within the speed limit, stay alert, watch for signs that indicate the area is popular with wildlife and avoid distractions. This means not eating, tuning the radio or grooming. (And of course you would never think of using a handheld device while driving!) Never throw food out of your car. This attracts moose and other wildlife to the roadside. When driving at night, be sure you’re rested and fully awake. If you have a passenger along with you, place them on watch through the signed areas. While moose can be somewhat mild-looking, according to Wikipedia, in North America they injure more people than any other wild mammal. (Hippopotamuses hold the worldwide title). A passenger vehicle that hits a moose at high speed breaks the moose’s legs, which causes the moose’s body to land on the car’s hood and windshield, crushing the front roof support beams. This can be fatal to people in the front seat. (And an unhappy ending for the moose too). If you see a moose at the side of the road, carefully slow down but don’t honk; a harassed or startled moose may charge. They have a reputation for being touchy and unpredictable – as demonstrated by one in Prince George last month, who decided to show an RCMP officer and his parked vehicle who was superior. (The moose came out on top – literally – when it stepped onto the cruiser’s roof). As a pedestrian it’s also wise to stay clear of this critter. 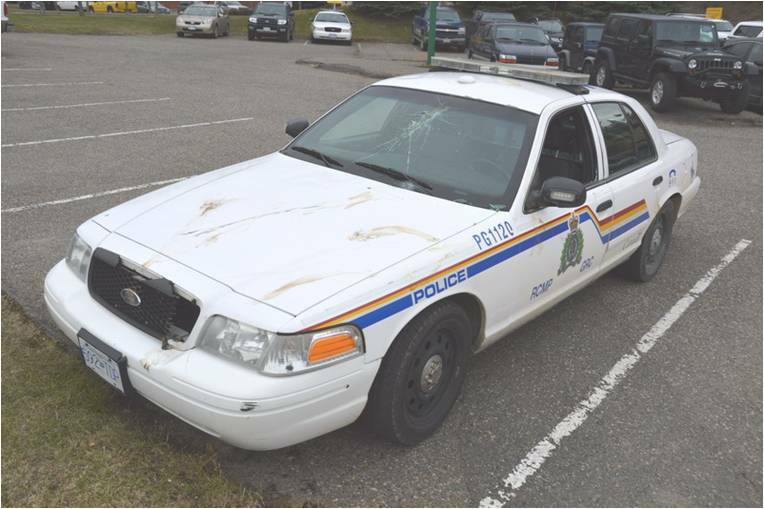 A moose stepped onto this vehicle’s roof, breaking a window and bruising the RCMP officer inside. The stately moose is an animal you don’t want to go hoof-to-vehicle or hoof-to-toe with, on B.C. highways or any place. Like most solitary types, it needs its space. So, it’s best for your safety and the animal’s well-being, if you miss the moose. “The majestic moose is the second largest animal in B.C.” what is the biggest? Hi Michelle, thanks for the question. Really liked what you had to say in your post, The Mighty Moose on BC Highways: A Force to be Reckoned with | TranBC, thanks for the good read! Glad you liked it Lindsey!